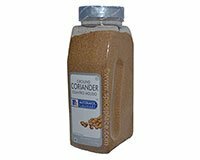 McCormick Ground Coriander is the ground seed of an ancient plant that has been used in seasoning food for centuries. Coriander and is said to be the color of manna (the bread from heaven). Coriander comes from the Mediterranean basin and it has a slight lemon flavor. Use Coriander with sweet or savory dishes. Coriander has a distinctly citrusy and musty aroma. Its flavor is described as being minty, sweet, and citrus-like. Coriander is produced from the dried, ripe fruit of the herb Coriandum sativum. The herb Coriandum sativum is of the parsley family and, so, Coriander is related to other herbs such as caraway, anise, fennel, and cumin. Add 1/2 to 1 teaspoon ground Coriander to pound beef, chicken or fish. Use 1/4 teaspoon ground coriander for 9-inch apple pie or 2 cups rice pilaf.